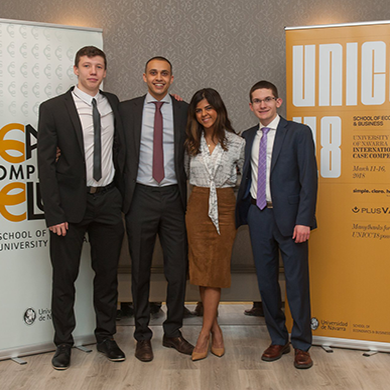 From March 11-17, a team of four Lazaridis School of Business and Economics students travelled with Dr. Sofy Carayannopoulos to Pamplona, Spain to participate in the sixth annual University of Navarra International Case Competition (UNICC). The UNICC is a prestigious, international case competition that attracts top business schools from around the globe. While numerous schools apply, annually only 16 schools are invited to participate. Over the course of six days, Samantha Sells (fourth-year Double Degree BBA and Financial Math), Matthew Donovan (third-year Double Degree BBA and UW BMath), Isaac Fisher-Jhirad (fourth-year BBA) and Ruslan Nikolaev (third-year Double Degree BBA and UW Computer Science) participated in the two three-hour and one 24-hour case competition, winning their division in each stage, and eventually going on to take gold. Case competitions, such as UNICC, provide students not only with the ability to put their classroom teachings to the test, but also introduce them to the international business landscape.